Not only does she snore loudly though, she also sometimes stops breathing for a second. I'm worried. What should I do? I'm very glad you decided to ask what you should do. If your daughter is snoring loudly and appears to have moments where she stops breathing in her sleep it seems very likely that she may be experiencing sleep apnea. 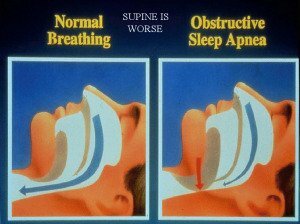 Obstructive sleep apnea causes the airway to close during sleep, which makes the sleeper stop breathing until he or she awakens for a second or two to take a breath. The word "apnea" means to stop breathing. Sleep apnea is VERY common in adults, but it certainly does occur in children as well, although a bit less frequently. In any case though, sleep apnea should be taken very seriously because it puts a lot of strain on the body to have to struggle to breathe every night. Sleep apnea also usually shows itself with fatigue, moodiness, or hyperactivity during the day. If your daughter does have sleep apnea, each time she stops breathing at night she would have to wake up for a split second to take a breath, which seriously compromises her body's ability to get a good night's sleep. This in turn can lead to problems growing, because the growth spurts that would normally take place during deep sleep get disrupted when the child awakens to breathe. Since you are noticing your daughter struggle to breathe in her sleep, you should definitely bring her in to see a sleep physician. The physician will be able to examine your daughter's sleep and tell you the best way to go about making her sleep better. You are definitely right in being concerned, and you did the right thing to ask for help. Now you must take one more step and see a sleep doctor. 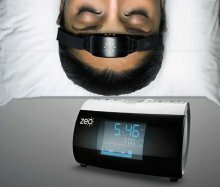 There's more information you can read about how sleep apnea in children leads to daytime tiredness or hyperactivity here. 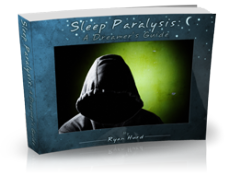 And you can also learn more about what sleep apnea is and how it happens here. If you have more questions, please feel free to follow up by clicking the "post comment" link below. My 4mnth old son has been congested since birth. He has mucus in his nose constantly. When alseep he snores and snuffles always sounding like he has a cold. Sometimes it seems he stops breathing briefly then starts again with a deep breath. His breathing has been monitored whilst in hospital at 2 months of age (on a unrelated matter) and his "saturation" levels were fine even though Dr's could see he was skipping a breath. I was told because saturation levels were ok not to worry...? Also, my son has had 4 episodes in the last month where he is asleep but moans and groans has increased rapid breathing and sometimes moves head from side to side. Dont think its a seizure as his arms and legs and body remain still....Almost appears he is having anightmare. Is that possible at his age? Showed Dr video of this and Dr said he was in REM sleep as eyes were moving?? If wew ake him he starts to cry. The breasts rise and fall intensely and explosively and the noise sound like a chain saw. My 15 year old niece disassembled at night suddenly a lot of wood. The girl suddenly has strong respiratory problems and snores like crazy. For two hours she is now working on breaking down all the tree branches into individual slices. She seems to have great endurance , because the volume remains consistently high. The room must already be full of sawdust from their logging operations . She snores so horribly that you hear it in the whole house . She has a slim figure and has no bad cold . I just checked again in her room. She has no pauses in breathing . Only the lifting and lowering of the breast was pronounced. When inhaled ( snoring sound) , the stomach has intensively raised and lowered the breasts and on the exhale , the belly has hastily lowered and raised her breasts. It looks like she was pure squeeze the air right in her chest . Is this a precursor to sleep apnea, although my niece has no pauses in breathing ? Or is she just become an extreme snorer ? The tonsils and adenoids have been removed when she was 4 years old. I'm really sorry for the girl that she has such breathing problems. Why my niece suddenly snores so extreme ?